Background: Patients with asthma are interested in the use of breathing exercises but their role is uncertain. The effects of the Buteyko breathing technique, a device which mimics pranayama (a yoga breathing technique), and a dummy pranayama device on bronchial responsiveness and symptoms were compared over 6 months in a parallel group study. Methods: Ninety patients with asthma taking an inhaled corticosteroid were randomised after a 2 week run in period to Eucapnic Buteyko breathing, use of a Pink City Lung Exerciser (PCLE) to mimic pranayama, or a PCLE placebo device. Subjects practised the techniques at home twice daily for 6 months followed by an optional steroid reduction phase. Primary outcome measures were symptom scores and change in the dose of methacholine provoking a 20% fall in FEV1 (PD20) during the first 6 months. Results: Sixty nine patients (78%) completed the study. There was no significant difference in PD20 between the three groups at 3 or 6 months. Symptoms remained relatively stable in the PCLE and placebo groups but were reduced in the Buteyko group. Median change in symptom scores at 6 months was 0 (interquartile range −1 to 1) in the placebo group, −1 (−2 to 0.75) in the PCLE group, and −3 (−4 to 0) in the Buteyko group (p=0.003 for difference between groups). Bronchodilator use was reduced in the Buteyko group by two puffs/day at 6 months; there was no change in the other two groups (p=0.005). No difference was seen between the groups in FEV1, exacerbations, or ability to reduce inhaled corticosteroids. Conclusion: The Buteyko breathing technique can improve symptoms and reduce bronchodilator use but does not appear to change bronchial responsiveness or lung function in patients with asthma. No benefit was shown for the Pink City Lung Exerciser. There is interest in the use of complementary treatment for asthma and a third of respondents in a recent asthma survey had tried one or more breathing techniques to relieve symptoms.1 However, few controlled studies have been undertaken to determine the effectiveness of these approaches. We have previously studied two components of pranayama,2 the yoga breathing exercise, by asking subjects with asthma to breathe twice a day through a cylinder with an expiratory resistance (the Pink City Lung Exerciser (PCLE)) designed to reduce breathing frequency and increase the duration of expiration. There was a small reduction in airway responsiveness to histamine after using the PCLE for 2 weeks compared with a placebo device without a resistance. A BBC television programme in 1998 generated considerable interest in the Buteyko breathing technique. The technique, developed in Russia by Konstantin Buteyko, is based on the belief that asthma is caused by hyperventilation and hypocapnia and can be cured in most patients by using special techniques to reduce minute ventilation.3 The effects on asthma control in two small controlled studies in Australia were modest, however.4,5 The Eucapnic Buteyko method is an adaptation of the Russian technique which was first introduced in Australia but is now used worldwide. It includes the same focus on ventilation control but the approach has been designed to suit patients in western countries. 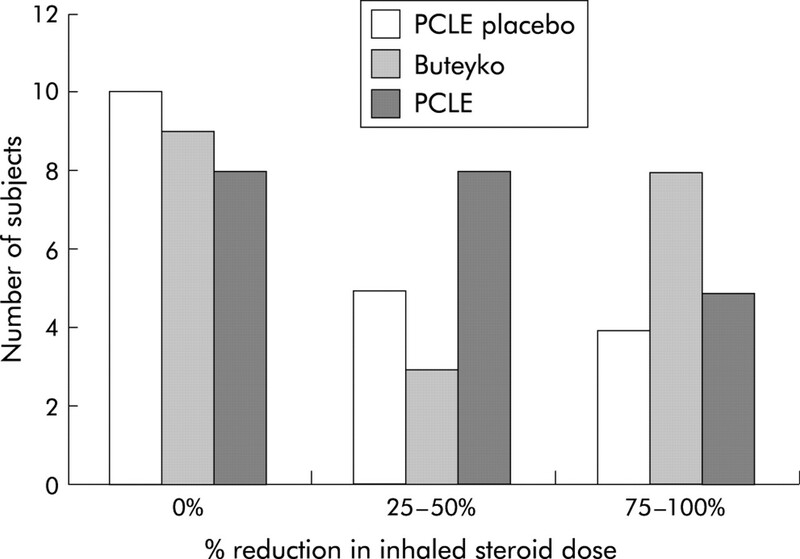 We compared the effect of the Buteyko technique, pranayama exercises using the PCLE, and the PCLE placebo device in subjects with asthma. Symptom scores and bronchial responsiveness to methacholine were the primary outcome measures. Non-smoking volunteers aged 18–70 with stable asthma but no other important illness were recruited between September 1999 and November 2000 from our asthma volunteer database and from posters and newspaper advertisements. Inclusion criteria included: taking an inhaled short acting β2 agonist at least twice a week and regular inhaled corticosteroids with no change in dose in the preceding 4 weeks; pre-bronchodilator forced expiratory volume in 1 second (FEV1) of at least 50% predicted and a 10% increase following 400 μg inhaled salbutamol; a provocative dose of methacholine causing a 20% fall in FEV1 (PD20) of 10.24 μmol or less; and a mean daily symptom score of one or more during the run in period. Subjects taking treatment other than sodium cromoglycate (one subject) were excluded. Written consent was obtained from all subjects and Nottingham City Hospital ethics committee approved the study. FEV1 and forced vital capacity (FVC) were measured with a dry bellows spirometer (Vitalograph, Buckingham, UK) as the highest of two successive readings within 100 ml. Methacholine PD20 was measured by a breath activated dosimeter (MEFAR, Brescia, Italy). Nebulisers had an output of 10 (0.5) μl at 1 second and calibration was checked every 6 months. Subjects inhaled three puffs of saline followed by doubling doses of methacholine (dose range 0.02–42 μmol) until FEV1 had fallen by 20% from the post-saline value. FEV1 was measured 2 minutes after each dose and PD20 by linear interpolation on a log-dose response plot. Subjects kept diary cards to record breathing exercises, medication use, and asthma symptom severity during the day and night (both 0–5), plus activity limitation due to asthma (0–3; maximum combined score 13). Quality of life was assessed using the SF-366 and Asthma Quality of Life7 questionnaires. The study had a parallel group design with participants randomised to be taught the Eucapnic Buteyko technique or use of the PCLE or PCLE placebo device. Subjects underwent training (see below) and were asked to perform the exercises for at least 15 minutes twice a day throughout the study. A card sent 2 weeks later gave further encouragement. Subjects were followed for 6 months with an optional extension during which inhaled steroid reduction was attempted. Bronchodilator reversibility and methacholine PD20 were measured on separate screening visits. Subjects fulfilling the entry criteria entered a 2 week run in period. Eligible subjects were then allocated to one of the three treatment groups using the next available number from computer generated numbers, randomised in blocks of six, and using sealed envelopes prepared independently. To ensure sufficient numbers for the Buteyko sessions, randomisation was skewed towards the Buteyko group except for the last 12 patients who were randomised between the two PCLE groups. Subjects were only given details of their treatment. They attended the clinic after 1, 3, 5, 9, 13, and 26 weeks at the same time of day after withholding β2 agonists for 6 hours. Subjects were seen first by the training coordinator who dealt with queries about the breathing exercises. They then saw the clinical assessor who assessed asthma control and measured lung function, including methacholine PD20 at 13 and 26 weeks. The assessor was not told which breathing technique subjects were using and subjects were asked not to mention it. Subjects completed the two quality of life questionnaires before randomisation and after 13 and 26 weeks, together with a postal feedback questionnaire at least 6 weeks after completing the study. Subjects were asked to keep their dose of inhaled steroid constant throughout the first 6 months unless they had an asthma exacerbation. This was defined as a 20% fall in FEV1 or a 50% increase in β2 agonist use and >6 puffs on two of three successive days compared with the randomisation visit/run in period, or worsening asthma needing urgent medical care or rescue medication on two of three successive nights. 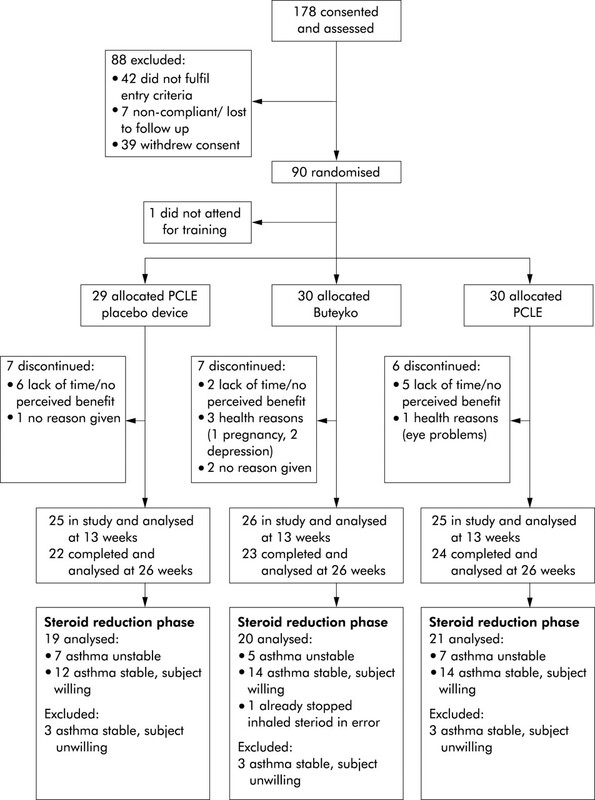 Steroid reduction was attempted 6 months after randomisation for subjects with stable asthma who agreed to take part. The dose was reduced by 25% every 3 weeks at a clinic visit until either the inhaled steroid had been discontinued, an asthma exacerbation occurred, or the doctor or subject felt that asthma control had deteriorated to an extent that merited reversal of steroid reduction. Training was given in small groups: numbers ranged from 3–8 in the Buteyko training sessions, 2–5 in the PCLE group, and 1–5 in the control group. The Eucapnic Buteyko technique, a western modification of the Russian Buteyko technique, was taught by a certified practitioner in five 2 hour sessions over a weekend or successive evenings. Subjects were taught exercises to reduce the frequency and depth of breathing and, as part of the technique, were asked to record pulse and breath holding time twice daily in a diary. They were instructed to use the breathing technique twice daily and to relieve asthma symptoms, and only to use their bronchodilator if that failed. Subjects were also asked to tape their mouth at night with hypoallergenic tape (Micropore) to prevent mouth breathing and were advised to avoid factors such as stress, exercise accompanied by deep breathing, oversleeping, and certain foods (for example, highly processed food and additives). Two weeks after the training the subjects were telephoned by the Buteyko practitioner to give encouragement and answer queries. Subjects could contact the practitioner for further advice if they felt it necessary. Training took place in a single session. The PCLE consists of a mouthpiece attached to a disc containing six apertures 2–5 mm in diameter with one-way valves which halve the cross sectional area during expiration and thus impose a 1:2 ratio on the duration of inspiration compared with expiration.2 With the device set to the largest aperture, subjects were asked to breathe in and out from residual volume to total lung capacity at a rate at which they felt no resistance to breathing and could feel no cheek movement. If, after a week, they could do the exercises without feeling breathless, they were encouraged to decrease the aperture size gradually to reduce respiratory rate. They were told to use their β2 agonist only for relief of symptoms. Training was identical to that for the PCLE group. The placebo device had an identical appearance to the PCLE but the apertures had no valve and a leak ensured no resistance to breathing. The primary efficacy variables were symptom scores and methacholine PD20. Secondary outcomes included FEV1, bronchodilator use, asthma exacerbation rates, quality of life assessments, and reduction in inhaled corticosteroid dose. All available data for the 89 patients who underwent training were analysed. When data were unavailable they were treated as missing. Codes were revealed after all data had been reviewed and entered. PD20 values were log transformed for analysis and expressed as change from the end of the run in period, as were FEV1, symptoms, and quality of life measures. Change in PD20 and FEV1 were compared between groups using analysis of variance, adjusting for baseline values as a covariate when there were baseline differences. The Kruskal-Wallis test was used to compare changes from baseline for steroid reduction, quality of life measures, median symptom scores, and bronchodilator use (for 7 days before each visit). We also carried out an analysis of the primary outcome measures, substituting missing data with the last recorded value before subjects withdrew. The results were virtually identical to those seen in our main analysis and are not presented. Summary of patients entered, randomised and withdrawn from trial. There was little change in PD20 from baseline during the study and no significant difference between the groups at 3 and 6 months (table 2). 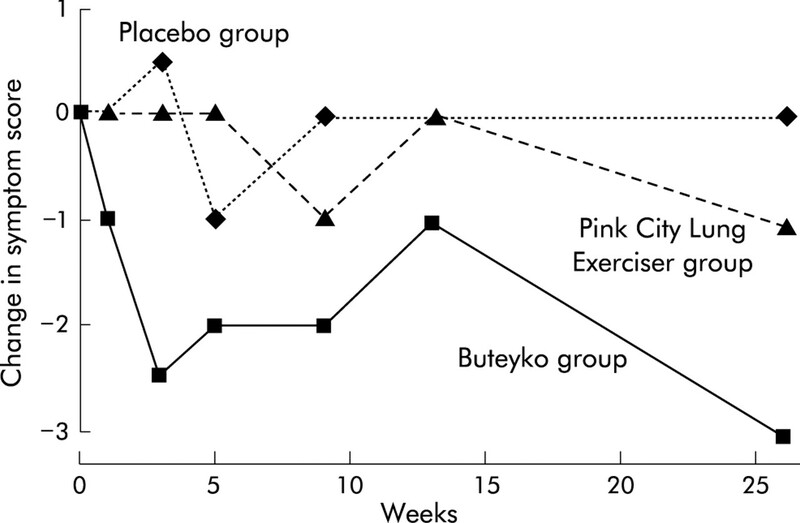 Symptoms remained relatively stable in the PCLE and placebo groups but were reduced in the Buteyko group (fig 2). The median (interquartile range, IQR) change in daily symptom scores at 6 months was 0 (−1 to 1) in the placebo group, −1 (−2 to 0.75) in the PCLE group, and −3 (−4 to 0) in the Buteyko group; the difference between the three groups was significant (p=0.003). Median change in symptom scores during the 6 month study. Number of subjects able to reduce inhaled corticosteroids in the steroid reduction phase. At the end of the study more subjects in the Buteyko group thought that they had definitely or probably received active treatment (15 + 8 of 26 respondents) than subjects in the PCLE group (4 + 9 of 25) or the placebo PCLE group (4 + 10 of 25) (p<0.001). There were 72 replies (81% response rate) to the postal questionnaire. Most subjects said they had been compliant with the breathing exercises during the study (see table 5 online at www.thoraxjnl.com/supplemental). Of 23 responders in the Buteyko group, 22 said they had practised the exercises twice a day while 14 in the PCLE group and 17 in the placebo PCLE group said they had practised for at least 10 minutes a day. Four subjects in the Buteyko group were unable to tape their mouth at night but 14 said they did it for at least five nights a week and eight did it every night. After completing the study 16 subjects in the Buteyko group had continued the exercises, at least on an occasional basis, compared with 12 and 9 in the PCLE and placebo PCLE groups. In this randomised controlled trial subjects taught the Eucapnic Buteyko technique had reduced asthma symptoms and bronchodilator use compared with the other two groups but there was no difference in bronchial responsiveness or FEV1. No difference was seen between the PCLE and PCLE placebo device for any outcome measure. A television programme in 1998 in the UK generated considerable media and patient interest in the Buteyko technique. The course used in this study, the Eucapnic Buteyko technique, was available to the general public. It includes breathing exercises, taping the mouth at night, strongly discouraging the use of β2 agonists except in emergencies, advice on lifestyle, and strong practitioner encouragement. Yoga breathing exercises (pranayama) involves mental concentration to cause a reduction in breathing frequency, a 1:2 ratio of inspiration to expiration, and a pause at the end of inspiration and expiration. The expiratory resistance in the PCLE imposes a reduction in breathing frequency and expiratory flow. Our study was larger and longer than the previous studies, and looked for the first time at bronchial responsiveness and asthma exacerbations. Although only averaging two puffs of β2 agonist a day on entering the study, subjects in the Buteyko group were able to reduce their β2 agonist use. Despite this, symptoms were reduced and there was no increase in exacerbations or use of inhaled corticosteroids. There was also an improvement in one of the eight dimensions of the SF-36 questionnaire (“Role limitation due to physical problems”). The changes in asthma quality of life and reduction in inhaled corticosteroids favoured Buteyko, but the differences were small and non-significant. There was no change in bronchial responsiveness or FEV1 despite clear potential for improvement. These findings support the suggestion10 that the Buteyko technique may help patients adapt to their asthma and feel more in control of their treatment. It does not appear to alter the underlying disease process, however. Since subjects in the Buteyko group were strongly discouraged from using β2 agonists, the extent to which the reduction in β2 agonist use was a cause or a consequence of a reduction in symptoms is uncertain. Our findings should be generalisable to patients who are interested in breathing exercises. The study is not able, however, to determine which subjects benefited from the Buteyko technique. Patients with asthma who also have dysfunctional breathing11,12 or who take more β2 agonists than they need13 may obtain most benefit, but further studies are needed to determine this. In a previous comparison of the PCLE and placebo device in subjects with mild asthma, the active PCLE caused a small reduction in bronchial responsiveness.2 We were unable to confirm this in the current study, perhaps because of differences in the populations studied or study duration. The PCLE involves only one aspect of yoga, and a 4 month trial of Sahaja yoga in asthma14 showed benefit over a control intervention. The need for controlled studies of complementary medicine is widely recognised with recent endorsement from a presidential commission in the US15 and a House of Lords Select Committee in the UK.16 Such studies are difficult to carry out, however, and our study raises several issues. The choice of a suitable control is one difficulty; subjects in the Buteyko group were more likely to believe they were receiving active treatment resulting, perhaps, in greater psychological benefit. On the other hand, use of the placebo PCLE as a control involved subjects in some change from usual practice since they were asked to focus on breathing for 30 minutes a day. Some subjects may have benefited from this since nine continued to use the device after the study ended, despite being told it was the placebo device. Any benefit from the placebo device would reduce the ability of the study to detect an effect from the other interventions. Maintaining blindness is another potential problem. Asking subjects not to mention the technique to the assessor worked reasonably well, although one mentioned Buteyko and an occasional subject mentioned a device, but which device was not clear. A formal study may also interfere with usual practice. A previous study4 was criticised because the Buteyko group received more follow up visits than the control group so we only included one follow up telephone discussion with the Buteyko practitioner. Most subjects were happy with this but nine would have liked more contact. A further problem is that advice from complementary medicine practitioners may differ from conventional advice and a few subjects found this difficult, particularly knowing whether to use a β2 agonist or the Buteyko technique to control worsening asthma. Finally, the success or failure of a treatment such as Buteyko relies heavily on the patient/practitioner relationship. The training sessions are long and patients need to be highly motivated to commit themselves fully to the training and need to practise daily. The success rate in a formal trial might therefore be less than that seen in everyday practice, since subjects did not specifically choose the Buteyko course and, because they were not paying, they may have felt less committed to seeing it through. Furthermore, subjects who may be considered unsuitable by Buteyko practitioners were not necessarily excluded by our entry criteria. Despite these problems, which are inherent in all studies of complementary medicine, and the differences in study design between our study and the previous controlled studies, our findings are broadly similar. They suggest that the Buteyko technique produces some benefit by reducing symptoms and use of bronchodilators and it may improve some aspects of quality of life. None of the studies found any improvement in airway calibre, however, and we found no effect on bronchial responsiveness or asthma exacerbations. The Buteyko technique may be worth trying in patients who are sympathetic to the ethos and are willing to commit the time required. The study was supported by The National Asthma Campaign. The authors thank Susan Mitchell and “Lifesource” for running the Buteyko classes and Dr Virendra Singh for supplying the Pink City Lung Exercisers and placebo devices. The authors are grateful to Tim Harrison for reviewing the manuscript and for providing medical cover and advice, along with Kate Phillips, and to Marie Cooper for help with the data entry. Ernst E. Complementary therapies for asthma: what patients use. J Asthma1998;35:667–71. Singh V, Wisniewski A, Britton J, et al. Effect of yoga breathing exercise (pranayama) on airway reactivity in subjects with asthma. Lancet1990;335:1381–3. Stalmatski A. Freedom from asthma: Buteyko’s revolutionary treatment. London: Kyle Cathie Ltd, 1997. Bowler SD, Green A, Mitchell CA. Buteyko breathing techniques in asthma: a blinded randomised controlled trial. Med J Aust1998;169:575–8. Opat AJ, Cohen MM, Bailey MJ, et al. A clinical trial of the Buteyko breathing technique in asthma as taught by a video. J Asthma2000;37:557–64. Ware JE, Sherbourne CD. The MOS 36-item short-form health survey (SF-36). I. Conceptual framework and item selection. Med Care1992;30:473–83. Juniper EF, Guyatt GH, Ferrie PJ, et al. Measuring quality of life in asthma. Am Rev Respir Dis1993;147:832–8. Egbagbe E, Pavord ID, Wilding P, et al. Adenosine monophosphate and histamine induced bronchoconstriction: repeatability and protection by terbutaline. Thorax1997;52:239–43. Hensley MJ, Gibson PG. Promoting evidence-based alternative medicine. Med J Aust1998;169:573–4. Thomas M, McKinley, RK, Freeman E, et al. Prevalence of dysfunctional breathing in patients treated for asthma in primary care: cross sectional survey. BMJ2001;322:1098–100. Keeley D, Osman L. Dysfunctional breathing and asthma. BMJ2001;322:1075–6. Harrison TW, Oborne J, Wilding PJ, et al. Randomised placebo controlled trial of beta-agonist reduction in asthma. Thorax1999;54:98–102. Manocha R, Marks GB, Kenchington P, et al. Sahaja yoga in the management of moderate to severe asthma: a randomised controlled trial. Thorax2002;57:110–5. McCarthy M. US panel calls for more support of alternative medicine. Lancet2002;359:1213. House of Lords Select Committee on Science and Technology. Complementary and alternative medicine. 6th report 1999–2000 [HL123]. London: Stationery Office, 2000. The tables are available as downloadable PDFs (printer friendly files).